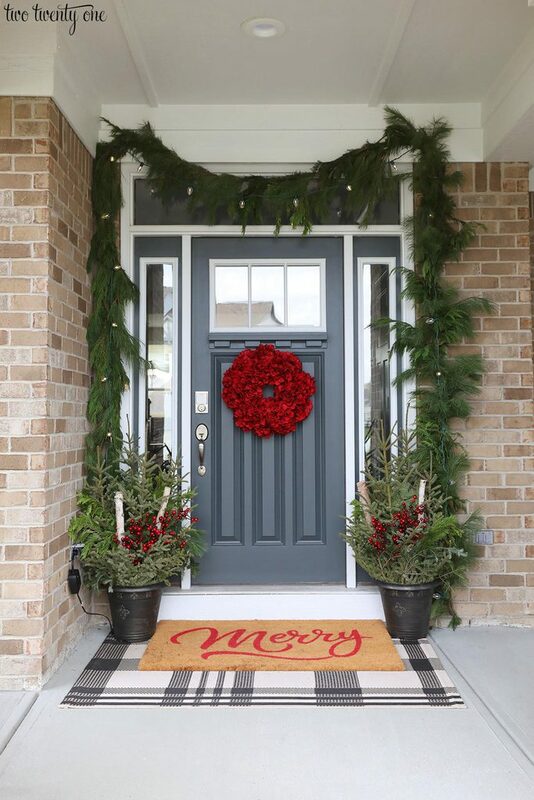 We don’t go all out with the outdoor Christmas decorations, but I love a nicely decorated front porch. Today I’m sharing our front porch and the planter that sits between our garage doors. I’ve also joined Taryn‘s Christmas Front Porch Blog Tour, so if you’re stopping by from Just a Girl and Her Blog, welcome! Before we get to the front porch, I wanted to show you our garage planter. I dug a big hole and placed a pre-made Costco holiday greens planter inside the big blue planter. Then, I filled it in with more greens from an extra garland I bought at Costco. 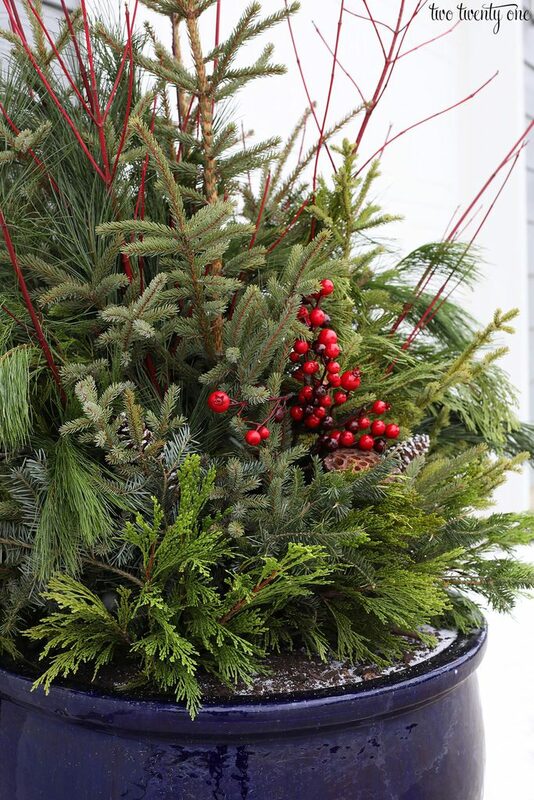 Seriously, you can’t beat the holiday greens planters for $30 each. And, they last past Christmas. I want to say mine from last year looked pretty good until February. I wish I took a picture of the planter before I added the additional greenery. The added greens helped to fill it out and added more textures and shades of green to the planter. 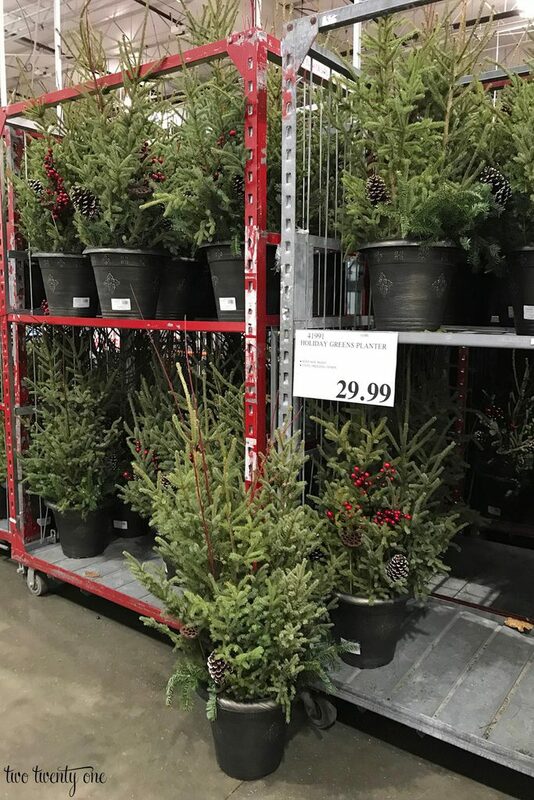 Some people were confused last year about the Costco planters, so here’s what they looked like in-store. They’re a little tall, so I had to lay them down in the back of my SUV. The fresh garland is on top of the planters. I believe it’s around $17 for 25 feet. Now, I’m not going to lie, the front porch looks a lot like last year’s front porch. But, you know what, when I like something, I tend to repeat it with some tweaks. Although I’ll add that the Costco planters are quite a bit taller this year compared to last year. 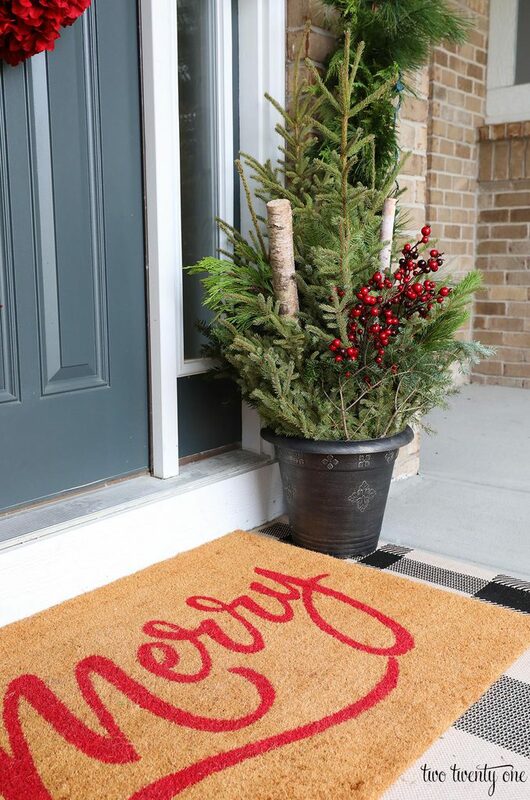 The ‘merry’ doormat is from last year, but it’s currently in stock! It’s just so damn festive. And the plaid indoor/outdoor rug is a permanent fixture on the front porch. I did edit the planters a little bit. I bought a bundle of fresh greens from Trader Joe’s and divided it amongst the two planters. Like with the garage planter, this helped add texture and color. 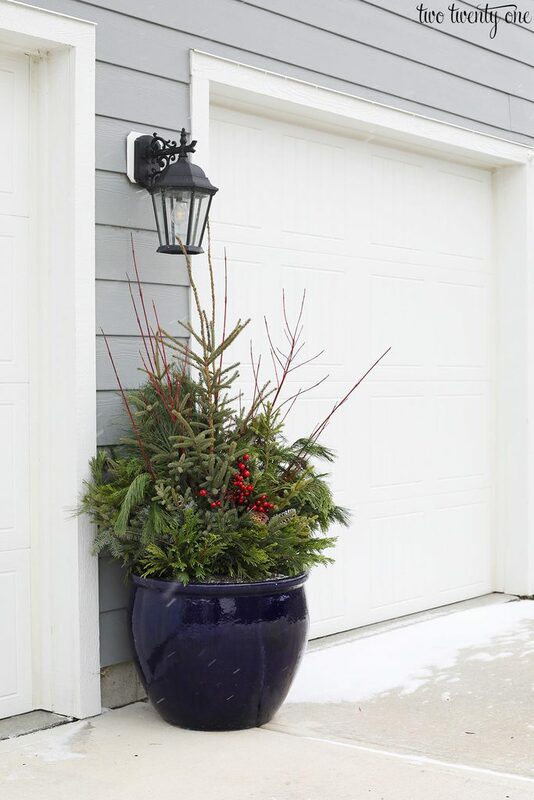 I also removed the red branches (and put them in the garage planter) and pinecones. Then, I added in the birch logs and red berries that I saved from last year’s Costco planters. I beefed up the garland by snipping greens from the extra garland I bought and wired the greens to the hanging garland. Then, I topped it off with a strand of white C9 lights. In case you’re wondering, I hang the garland on two big nails. I made this red hydrangea wreath in less than 10 minutes– it’s so big and fluffy. Michael’s had their fall floral stems on clearance for 75% off a few weeks ago. Since they had a lot of reds, I stocked up for Christmas. I used wire cutters to snip the stems shorter and stuck the stems into a Styrofoam wreath form. Boom. Done. And if I want to use the flowers for something else in the future, I can just pull them out of the Styrofoam. I’m pretty happy with how the porch turned out this year. Looking for more Christmas porch inspiration? Take some time to check out all of the beautiful blogger porches today! And if you’re following the tour, Tatertots and Jello is next. 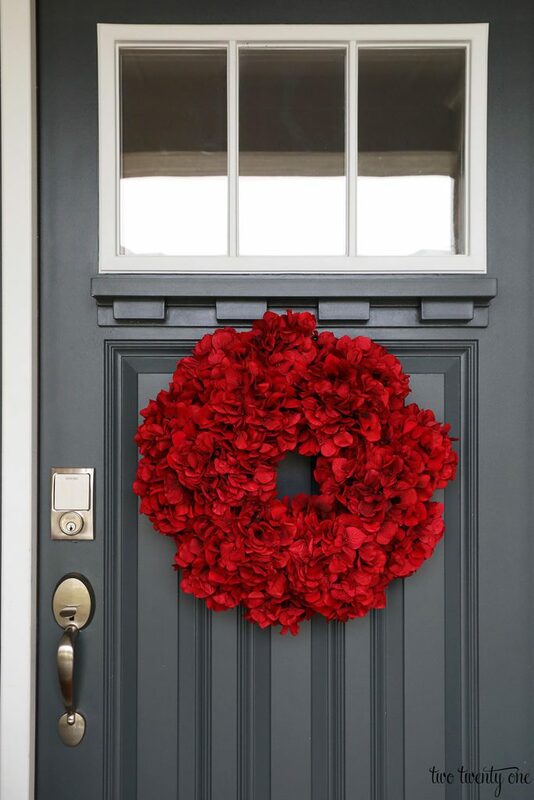 I’m obsessed with your red wreath! I might give this a go, I hope mine turns out like yours did! Your porch and planter look so beautiful, Chelsea! Can’t go wrong with fresh greens! Hope you’re having a wonderful week! LOVE your red wreath! I’ll have to remember that for next year when Michael’s has their sale again! 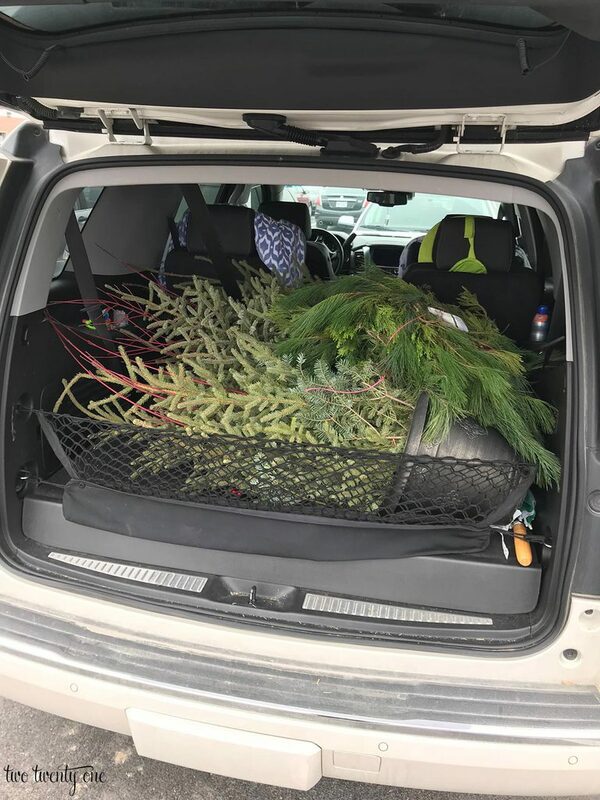 I also didn’t know that Costco carried garland and holiday planters. I need to check my store this weekend! So purdy!!! Digging the red hydrangeas!!! I love your porch! Wreath is fabulous and I love the layered rugs. What size is the plaid rug under the Merry mat? Kicking myself now for not getting to Costco sooner, those planters are awesome. Loving all your red and green touches! 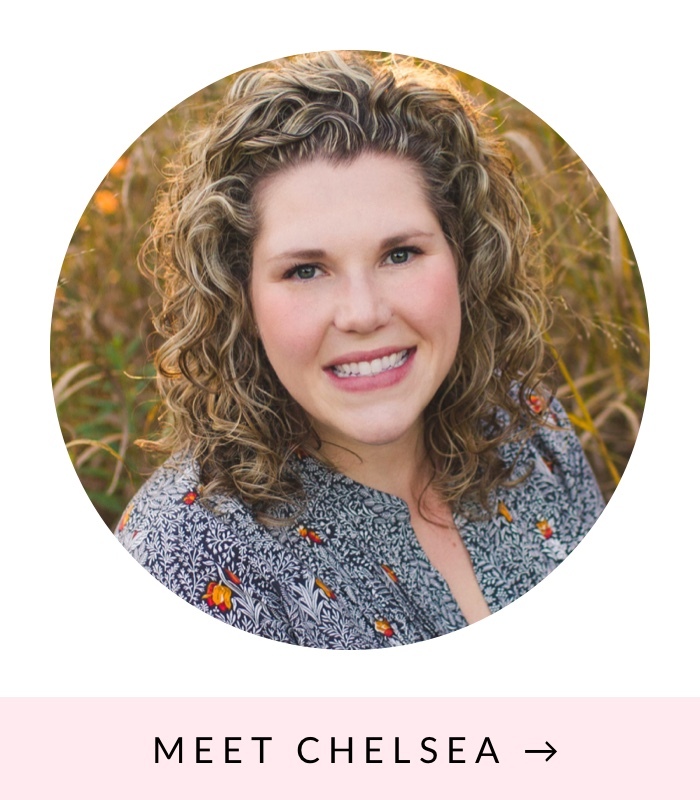 So beautiful Chelsea! I love your merry rug and red wreath! Super festive! 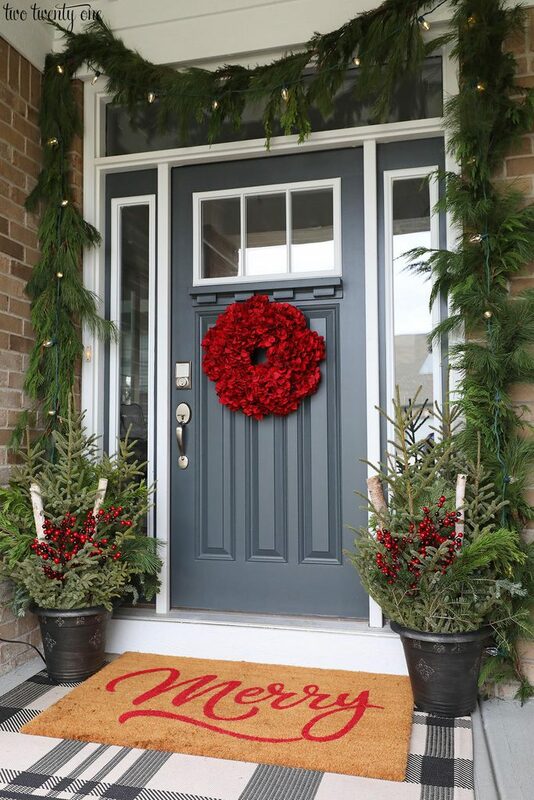 love the look, especially the red wreath. beautiful. 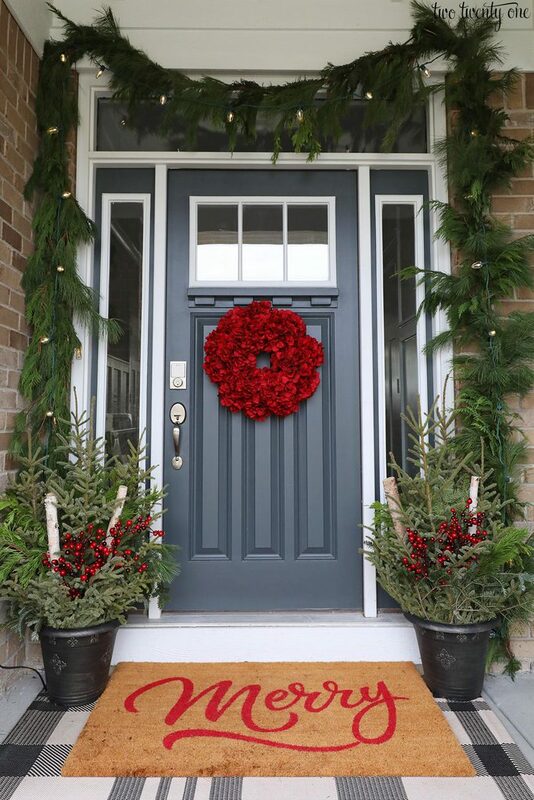 I love that pop of red with the wreath. Gorgeous and it will last all winter, win win! THAT WREATH! Oh my goodness it is showy and so beautiful!!! 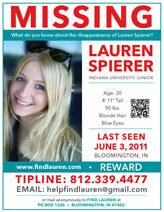 I have a blue door too and I’m pinning your post to remember the wreath! Beautiful porch! Gorgeous!! I’ve always wanted to do a fresh garland around our door but never seem to get around to it. Love the layered doormat too! Looks beautiful Chelsea! What size is the plaid rug on the front porch? That wreath is fantastic! Hydrangeas ftw!! !